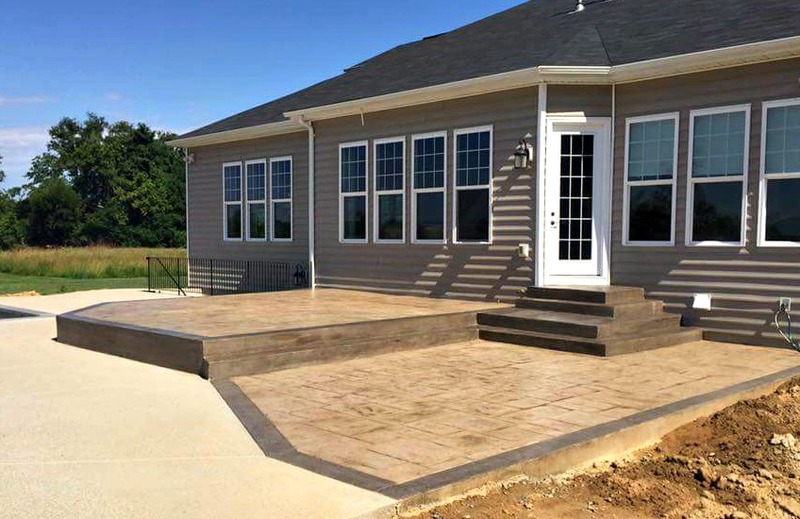 While properly poured and cared for stamped concrete surfaces are built to last, seasonal maintenance is a crucial step to the longevity. Now that the colder weather is behind us it’s time to clean up our patios, pool decks and driveways and welcome the summer months! Is your concrete surface in need of a reseal? Keep it looking as good as day 1. 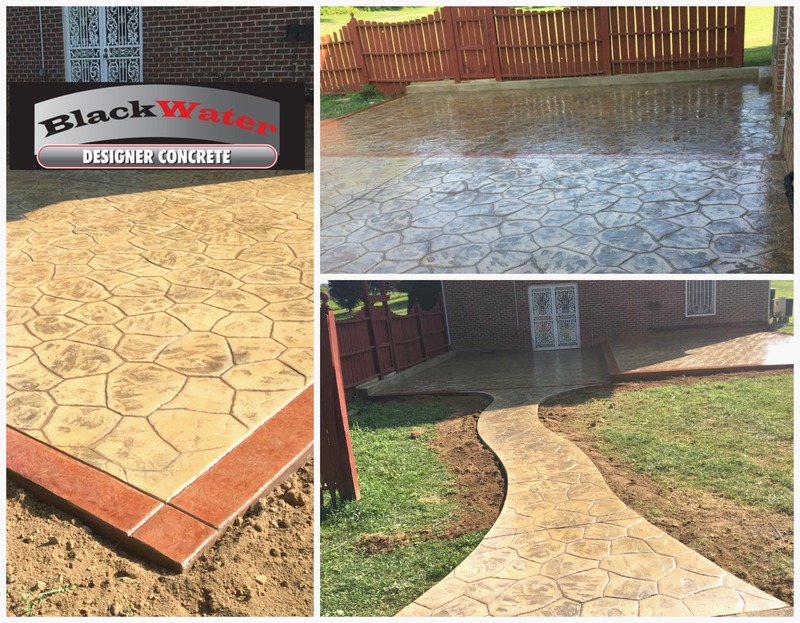 Take a look at this stamped patio poured 3 years ago. With a fresh coat of sealant, the beauty still holds true. Periodic sealing is the best way to protect your concrete from moisture penetration, staining, freeze-thaw conditions, de-icing chemicals, and abrasion. 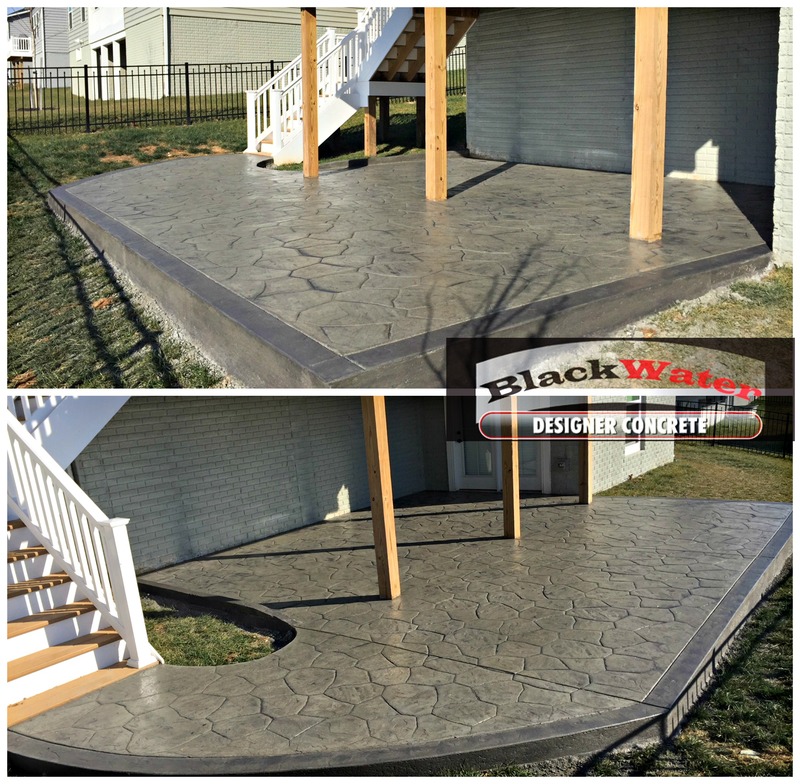 Get on a maintenance plan with us at Blackwater to properly maintain your decorative concrete annually. Check out some other useful tips for keeping your concrete surface clean and clear. Keep the surface free of debris by using a broom, leaf blower, or rinsing with water. Exterior surfaces can be pressure washed or scrubbed with a mild detergent. For interior surfaces, wet mopping or dry dust mopping of the floor is typically the only routine upkeep needed. Don’t allow debris to sit for long periods of time on an area of the surface. There are a variety of ways to remove stubborn stains such as dirt, tire marks, leaf stains, and grease spots. In these cases, water may not be enough. This is when stronger cleaning chemicals or a power washing and scrubbing may be required. Read more about power washing, using chemicals to clean stains, removing oil on concrete. One of the first patio’s we did 11 years ago. We just re-sealed again, looks like the day we left. Sealer is key! Eliminate the mess from your backyard. Do you find yourself getting frustrating when dirt and grass get tracked into your clean floors? Do you have dogs who like to dig, or use the bathroom in the same spot creating dead grass or concentration of unpleasant smells? Is your backyard space in constant shade, therefore create a forever damp area not usable for outdoor entertaining while also harvesting a breeding ground for pests, like mosquitoes? Do you simply hate yard maintenance? The list of reasons could go on and on but one common factor is the solution. Creating a patio to fit the space you have can fulfill the solution for the source of frustration. 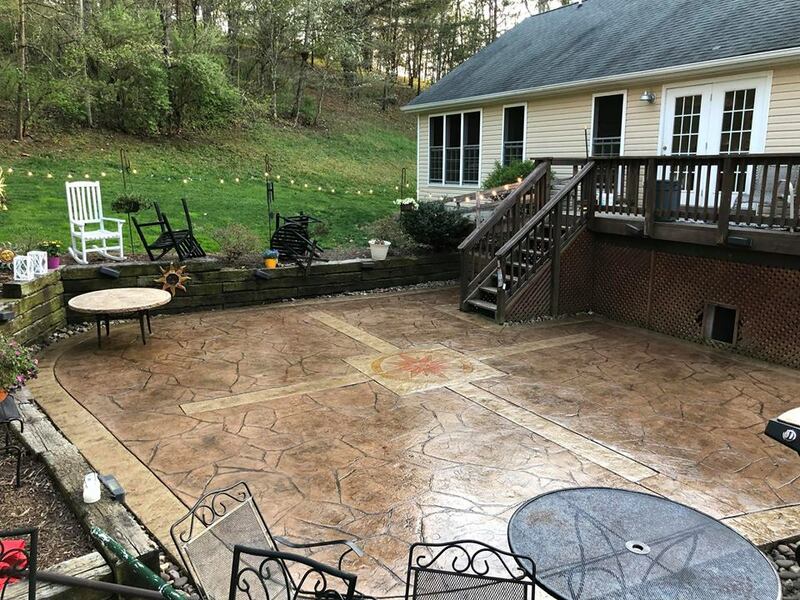 A decorative concrete patio is visually appealing and creates a functioning space for any purpose. Another benefit is the simple maintenance. It’s easy to clean, it eliminates yard maintenance, and creates an outdoor entertaining space that can be controlled to the level of your comfort. Small or large, simple or complex in design; design a concrete patio surface that makes you happy! Our team recently finished this Ashlar Slate Patio design. Hand stamped and Hand stained with borders and a step up. We created an open patio design great for outdoor entertaining. With varying levels there are plenty of options to create seating or BBQ areas, perfect for hosting any gathering. Create a flexible space that allows you to utilize it for any need. Another great job done by our crew! Backyard patio ready for lounging and grilling on. Create a carefree space to enjoy the outdoors. 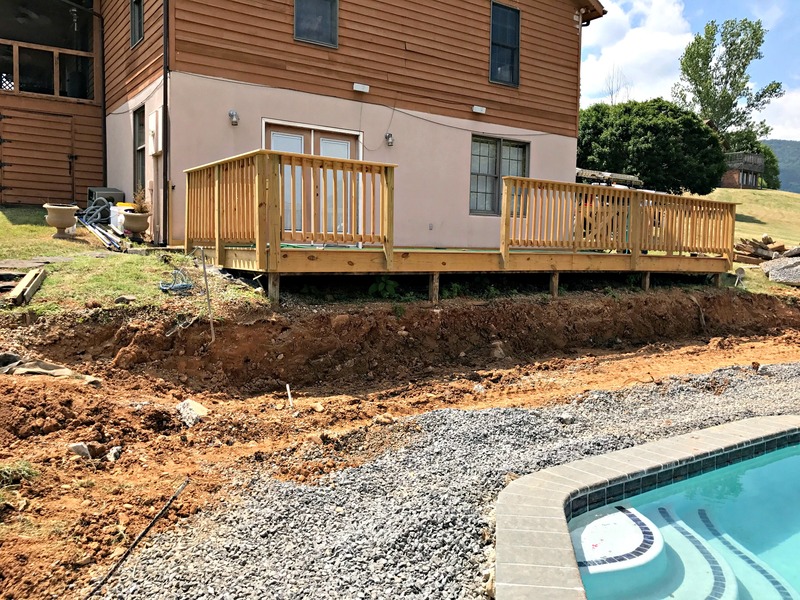 No mud and dirt getting tracked in the house, eliminate the amount of bugs intruding your space, minimize your yard upkeep, and enjoy. Get your FREE consult and estimate today. 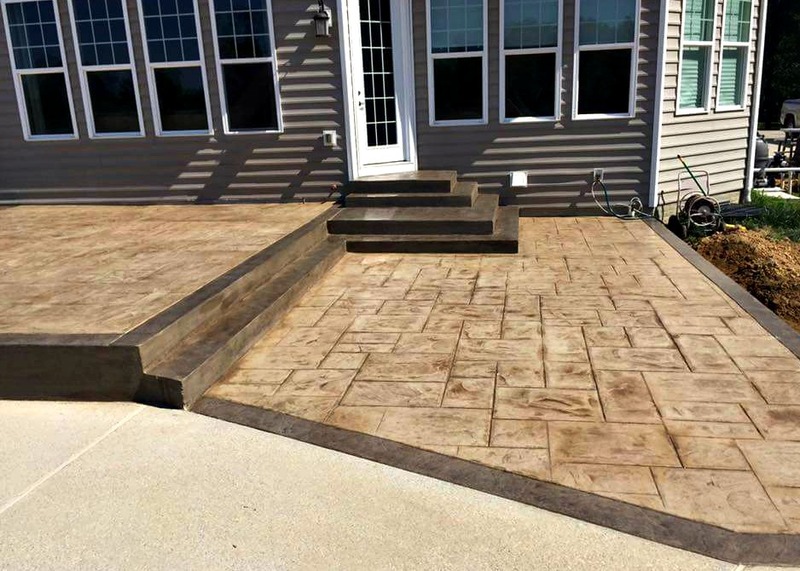 Customize your patio look with a wide range of color selections, styles and patterns with concrete. As your design specialist, we can provide you with the endless opportunities made possible with concrete. We recently completed this patio with a curved edge finish. 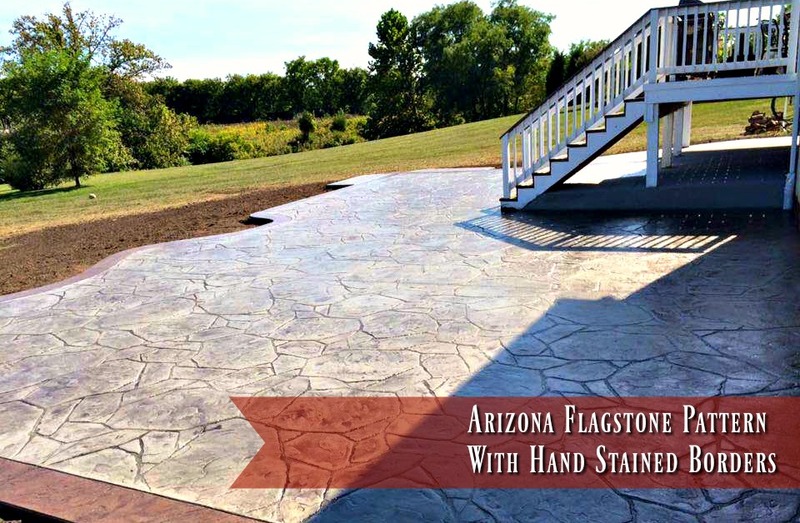 They feel in love with the Arizona Flagstone pattern in gray and chose a hand stained boarder for contrast making a great compliment to the overall design. 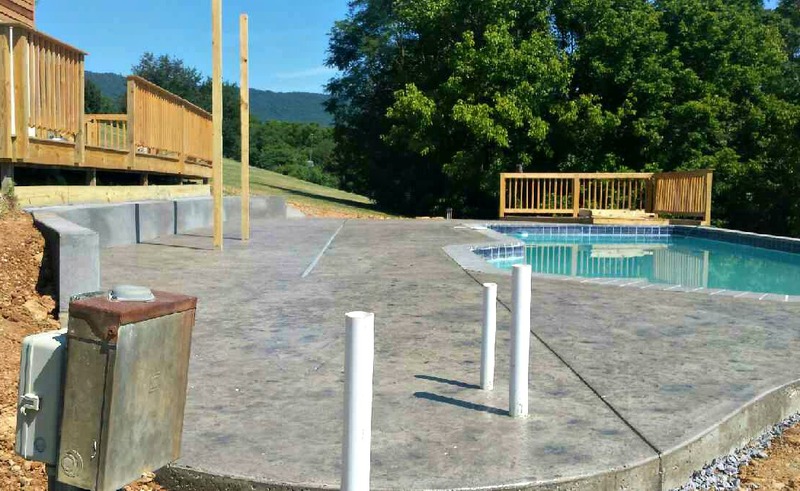 3 simple reasons why you need a decorative concrete patio. Who doesn’t love sitting outside on a warm night? Perfect summer breeze flowing, sound of a fire crackling, peace and quiet or laughs from your family and friends….makes for a wonderful evening well spent in your own backyard. Take advantage of the space you can utilize right outside your door. Don’t waste a day with good weather inside when you can take in the fresh air while still being comfortable on a patio designed just for you. 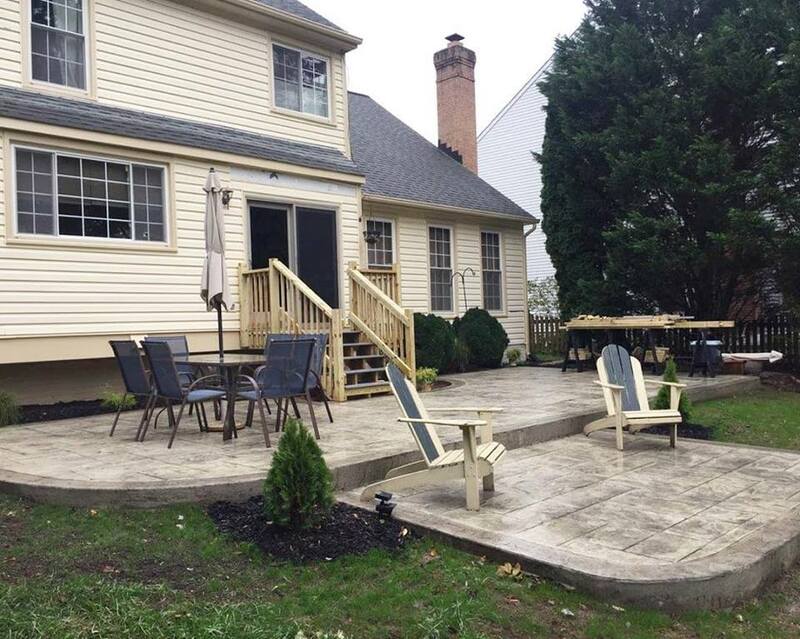 Increase the resale or appraisal value of your home by adding a patio. 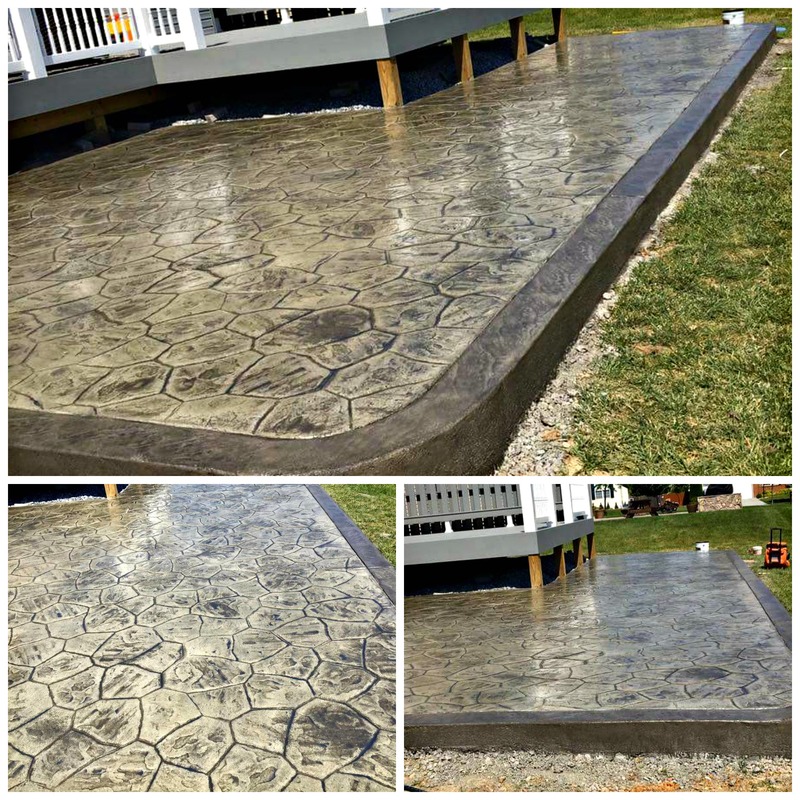 Beyond being aesthetically pleasing, a designer concrete patio can add that boost to the overall appeal of your home. A patio creates a functioning and visual space that acts as an upgrade to your property. 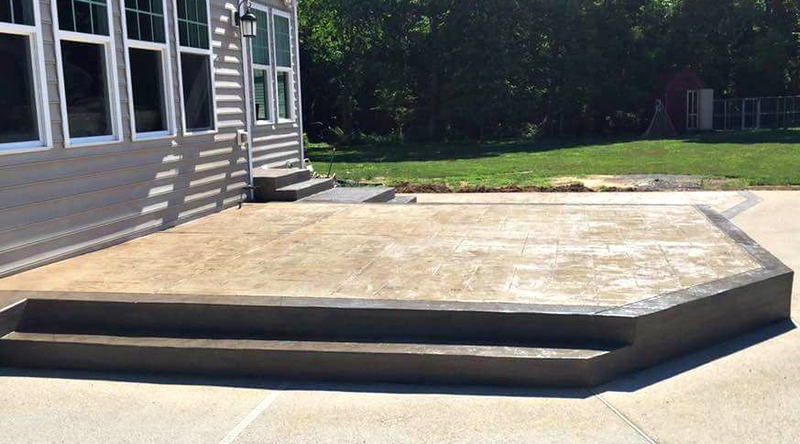 A well poured concrete patio needs minimal maintenance to last for years to come. With proper seasonal care, your patio will withstand the seasons and usual wear and tear over the years. With a patio covering up a portion of your yard that’s less moving, weeding, and/or gardening needed! 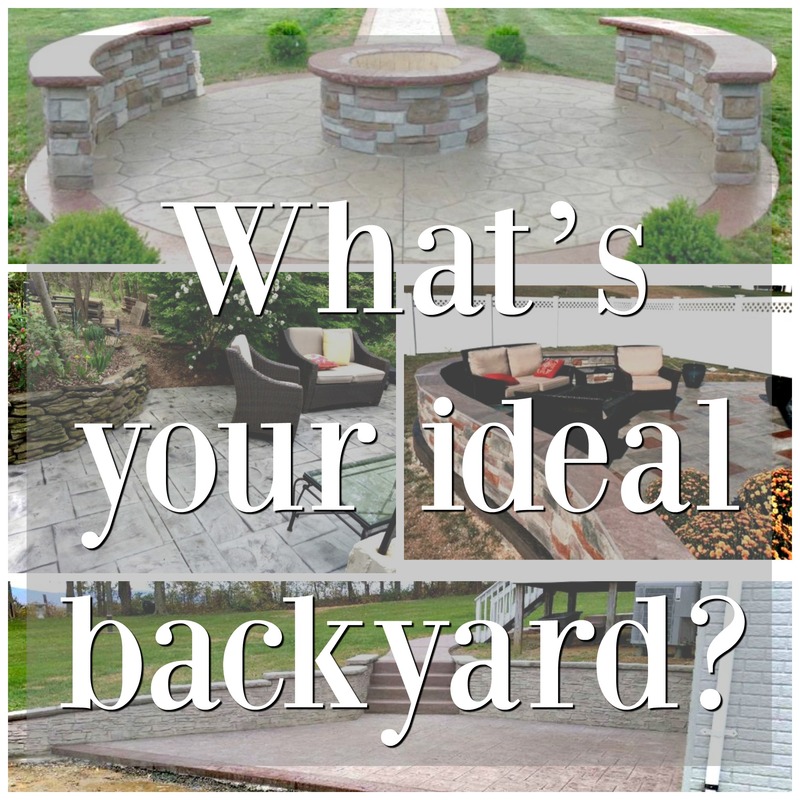 Create a backyard oasis that fits perfectly for your lifestyle isn’t as hard as it may seem. Call us for a free consult. We can walk you through all the options and help you make your ideas come to life!